Mechanical Engineering senior Greg Holland will be the student speaker for the Clark School of Engineering's Winter Commencement Ceremony held December 20th at the University of Maryland Cole Student Activities Building. A local from nearby Montgomery County, Holland has always been interested in the mechanics of how things move. In high school, he and a friend came up with an idea for a levitation machine which consisted of running a high current through a copper-wire vest. Unfortunately, the project was cancelled after a phone call home from the school’s physics teacher who was worried about him getting electrocuted. Nevertheless, Holland decided to study Mechanical Engineering to learn how to develop better, and safer, projects. Outside of the classroom, Holland worked part-time as an Operations Assistant in a gym to repair broken and malfunctioning exercise equipment in order to supplement his engineering education with hands-on skills. He also worked as a teaching fellow for the fluid mechanics course to help communicate engineering concepts to his peers in simple terms. 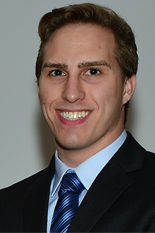 Holland served as the Events Chair and President for Maryland’s American Society of Mechanical Engineers (ASME). During this time, he organized visits to places such as NASA Goddard, and even a tour of the campus’ nuclear reactor. Holland is a member of the University Honors College and has a 4.0 GPA. He spent a semester abroad in Melbourne, Australia where he studied renewable energy technologies. During his time at Maryland, Holland has been able to work on design projects ranging from handheld consumer-products, to large-scale industrial systems. He plans to use his engineering degree to work towards expanding the use of renewable energies across the country. He would like to thank his parents and family, his friends, his professors and mentors, and the incredible staff members of the engineering department for all their hard work and support.